We look forward to providing a lifetime of care for your pet, and preventative healthcare plays a vital role in achieving a longer, happier life for them. Annual wellness exams for adult pets (ages 1-6) and twice-a-year wellness exams when older (ages 7+), provide an opportunity to discuss nutrition, behavior and other concerns with your pet’s doctor. These visits can help your veterinarian diagnose, treat or ideally prevent health problems before they become chronic or life-threatening. Campus Veterinary Clinic advocates for all pets be kept up to date on their vaccine schedule. Vaccines ensure your pet is inoculated against dangerous and potentially fatal illnesses such as distemper and rabies. We recommend that even indoor-only animals receive vaccines just in case they ever get out and are exposed to diseases. DHPP (distemper, hepatitis, parainfluenza, parvovirus): given at 8, 12, and 16 weeks of age, then one year after the last vaccine, then every 3 years. Sometimes given at 20 weeks of age to breeds that appear more susceptible to these diseases. Rabies: given at 16 weeks of age, one year later, then every 3 years. Bordetella (kennel cough): Given at 12 weeks of age, then yearly. Sometimes given every 6 months if boarded frequently. LEPTOSPIROSIS Given at 12 and 16 weeks of age, then yearly. FVRCP (Feline Viral Rhinotracheitis, Calicivirus, Panleukopenia): given at 8, 12, and 16 weeks of age, then one year after the last vaccine, then every 3 years. FeLV (Feline Leukemia Virus): given at 12 and 16 weeks of age then one year after the last vaccine, then yearly. Depending on risk exposure, this vaccine sometimes can be given every 3 years after 10 years of age. Rabies: given at 16 weeks of age, one year later, then annually. Some brands are labeled for every 3 years. 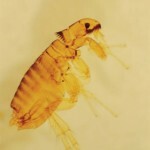 Berkeley and the surrounding areas are notorious for fleas, which can carry a host of diseases that can cost thousands of dollars to treat. We strongly recommend that all pets – even indoor-only – be regularly treated for the prevention of fleas, heartworm and other parasites. We carry a variety of topical and ingestable products, as well as Preventic collars. During the wellness exam the veterinarian will tell you which product will best suit your pet’s environment and lifestyle and be your safest choice. From dogs dashing out an open door to cats who wander too far from home, pets can easily get lost. Microchips enable lost animals to make their way home, having helped reunite thousands of pets with their families. We offer the most widely used microchip products that can be scanned at almost any veterinary facility, increasing the chances of safe recovery should your furry friend go missing. Campus Veterinary Clinic carries a large array of prescription drugs for cats and dogs so we can fill most prescriptions in-house. For our more finicky patients, we can order their prescription from a compounding pharmacy to have it flavor enhanced – making it far easier for you to administer their medication. For prescription refills, please call ahead to place your request and we’ll have it ready for pick-up in 24 hours. We offer a variety of prescription diets to help address your pet’s medical issues and maintain optimum health. Prescription diets are ordered as needed, so please call us one week in advance of when you’ll need more food. 5 stars Dr. Pierson and his nurses are incredible: super helpful, thoughtful and give the extended attention that is needed to make your pet (and you) feel at ease! 5 stars Can’t say enough good things about the folks that work here. Always have had good experiences and are so glad we found them. 5 stars I have frequented Campus Veterinary Clinic for a little over four years now. I have only positive things to say about them. The reception staff are attentive, warm, and efficient. The nurses are kind and do everything they can to make your beloved pet comfortable. The doctors are knowledgeable, comprehensive with their examination, and always communicate well with you. They avoid over prescribing medication as well. My cat once had surgery here and she was very well taken care of, and they proactively followed up on her recovery. A+.